Information about working time, setting time, how and what Reprorubber® can be applied to, as well as general information. Why are there three different versions of Reprorubber®? Reprorubber® is available in 3 different viscosities with 3 different cured hardness’. Thin Pour – can be poured or injected. Used mainly for internal molding. Orange – is the middle grade and can be used both internally and externally. The working time depends on the ambient temperature. The lower the temperature, the slower the material sets, and the higher the temperature, the faster the setting time. Approximately 1 minute is recommended. The setting time depends on the ambient temperature. The lower the temperature, the slower the material sets, and the higher the temperature, the faster the setting time. Generally, 7-10 minutes can be expected. What is the final hardness of the cured molds? Can I apply Reprorubber® to hot material? No, Reprorubber® should only be applied to material that are at or close to room temperature. Are there any materials that Reprorubber® should not be applied to? Reprorubber® may adhere to other rubber products. If you are unsure we recommend a test before using. Also, it is not recommended that Reprorubber® is applied to any fabrics. Is the cured sample water resistant? Yes, cured Reprorubber® is not affected by water. How can I remove the material if it gets stuck in my part? We recommend soaking Reprorubber® in Toluene (or something from the same chemical family). It will loosen and break down the cured material. Can the final replicas be painted? No, Reprorubber® cannot be painted. Can Reprorubber® to Reprorubber® castings be made? Yes – by first applying the Flexbar Epoxy Parfilm (part# 16136) to the cured part, Reprorubber® to Reprorubber® castings can safely be made. Can other colors or viscosities be manufactured? Not at this time. Please contact Flexbar with any special requests. Do you have any other Replica products? Yes – in cases where a hard replica is needed, please use our Facsimile, which makes accurate, hard plastic reproductions in 6 to 8 minutes. 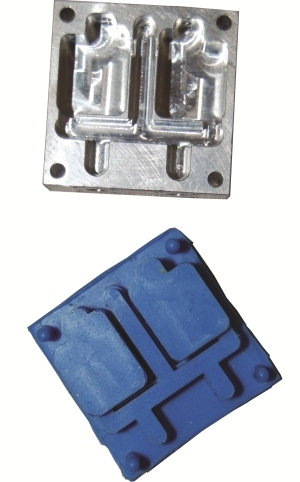 We also carry Reusable Low-Melting Alloys: Fine Proofing Alloy and Fixturing Alloy. Reprorubber® is guaranteed from 1 year from purchase to be free from defects. How should my Reprorubber® Kits be stored? Reprorubber® should be stored in a dry area at room temperature and in its original packaging. Keep all containers tightly sealed and away from direct light. Who can I call if I need Technical Assistance? Please contact Technical Service Department. Where can I buy Reprorubber locally? Please visit the Dealer Map for your local representative. Where can I request a catalog of all your products? Just Contact Us and we will be happy to send any literature you need.